I have gone through everyone of the replica lightnings and several in some cases. Taurus worked if you went slow like target shooting. This has been in the back of my mind ever since I read it... my Thunderbolt worked well when it was new - I put maybe a hundred rounds through it, then took it to a match and it choked on the first stage. Cleared the jam, and it choked on the second stage, and so on. So why did it work when it was new? Because I was shooting it at a "normal" speed! I got it out yesterday and tested the theory - four 10 round strings without a hitch when shooting slow & deliberate, but it immediately choked when trying to speed up. My Taurus Thunderbolt would jam and had terrible blow-by when I first got it. I was determined to get it working properly. After considerable experimentation I welded up the feed rails and remachined them. That and a little tweaking of the cartridge cutoff, coupled with using 250 grain bullets to eliminate blow-by solved all of the problems. Now it runs fine as fast or slow as you want to crank it. They are fun to shoot once in a while, but as a main match gun not so much. The Taurus will slam-fire out of the box. The Uberti can be made to slam fire by a simple adjustment to the safety lever on the hammer. A lot has to be done to the Pedersoli to get it to slam fire. (I'm providing slam-fire info because folks are usually curious about it - but I don’t personally recommend slam firing a Lightning for CAS). The Pedersoli features a foregrip release mechanism (“rocker arm”) that prevents the foregrip from coming back until the hammer strikes the firing pin (a very nice feature if you like to pull the rifle into your shoulder when aiming). The foregrip on the Taurus and Uberti can be pulled back and action opened while the rifle is cocked. Uberti version is loaded with safeties that make the action stiff unless you remove some of the safeties. It also makes the action not as smooth to run as the Taurus or Pedersolil. 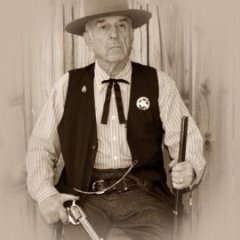 A ball-check on the Uberti's carriage (slide) helps to keep the action in a fully closed / foregrip-forward position - but it also puts a lot of drag on the slide's movement. 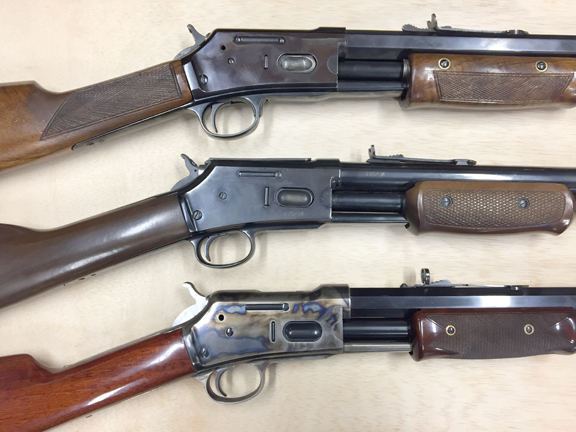 The wood and stock's finish is good on the Pedersoli and Uberti and pretty poor on the Taurus (the stock and foregrips on the Pedersoli shown here are mine). IMHO, the Pedersoli is the best overall made and best internal workings. The Uberti is second, and the Taurus is third. The Taurus has a dust cover (as on the original 1884 Colt Lightnings), other versions do not. Typically, the “.357" versions run better in .357 than they do with .38 SPEC cartridges (the 1.60” OAL is important for the .357 version). All three versions generally load and run better with .44-40, .38-40, and .45LC rounds (what the medium frame Colt Lightning was originally designed for) than they do with either the smaller diameter .357s or .38s. For staying on point of aim, the 26” barrel versions - while heavier - are steadier than the 20” carbine versions. With some work, a bit of know-how, and attention to detail, these rifles can be made to run as fast and reliably as any lever gun. My favorite Lightning is a Pedersoli with an octogon 26” barrell in .45LC. I regularly shoot three matches a month - plus regionals, etc., - and very rarely have my Pedersoli misfunction on me. When a misfunction happens, it is me misfunctioning on the rifle!! Reminds me of those trying to sell the flawed Chaparrals for those prices. They look good, just don't run. Double Whammy! See my Crappy Chappy thread! I had a USFA with a 26" barrel. With your hand almost at the receiver you have 2 foot of barrel out front, hard to start the swing to the next target, hard to stop when you got there, and that was the least annoying problem that gun had. This is first post that I've ever seen from someone who owned a USFA Lighting. Can you give us a rundown of it? Mine was ser# 2100, second one they built, first one sold to the public. That was according to them, I asked. You know what people say "never buy the first of anything", well turns out there is a good reason for that. It never ran right, sent it back 3 times and it never got better. Several people on the wire had them back then and I don't remember anyone liking theirs. Fit and finish was excellent, would have made a great wall hanger or collectors piece. Jammed at every stage. What caliber was your USFA? If it was .357, were you running .38s or .357s in it? Thanks CRP - if .44-40 they should have run really well. Bummer..